Celebrations have been taking place to mark the eight decades of the "People's Pavilion", which was designed by a refugee from Hitler's Germany. 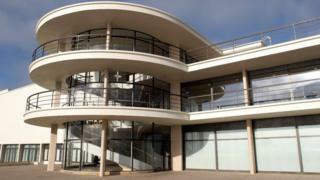 Bexhill's modernist De La Warr Pavilion was a sensation when it was opened in 1935, attracting thousands of visitors. After years of neglect, it was recognised as architecturally important in the 1980s and reopened after a major refurbishment in 2005. "This is a Marmite building," said Bexhill journalist John Dowling. "Right at the start in 1935 the design divided town opinion. "You loved it or you hated it and to some extent, people still do but it's the hub of the town." The building, which replaced seafront coastguard cottages, was the first in Britain to be made with a welded steel frame. Its two architects, German Erich Mendelsohn and Russian Serge Chermayeff, won a competition for the commission. Mendelsohn had already built public and private buildings in Germany including the Schocken department store in Chemnitz in 1928 and the Einstein Building in Potsdam in 1921. Chermayeff designed the interior of the BBC's new Broadcasting House and the Cambridge Theatre. In 2012, a re-creation of the last scene of the 1969 film The Italian Job was installed on top of the De La Warr as part of the Cultural Olympiad. The sculpture, a coach balanced on the edge of the roof, was installed by a crane.